Doris M. “Doree” Burton, 89, formerly of East Cleveland Street, Port Washington, died Friday August 24, 2012 at Kathy Hospice in West Bend after a brief stay. One year to the day of the passing of her grandson Michael. She was born on April 9, 1923 in Belgium, Wisconsin, daughter of George and Rose Weiland Demge. In her youth she helped out at the family grocery store. On June 29, 1946, she married Sylvester G. “Buddy” Burton of Port Washington at St. Mary’s Catholic Church in Lake Church. She moved to Port Washington where Buddy worked for Harnischfeger Homes. For over 50 years, they made Cleveland Street their home. He preceded her in death on April 4, 2000. She had been a clerk at the former Julianne Pincushion store and Christmas in Port retail store for many years. 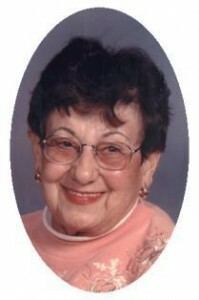 She loved to sew and was a great seamstress for herself, family and others. She had a great sense of humor and enjoyed Wednesday Night Ladies Bowling at Bley’s Recreation in Port Washington. She did not mind a chance to make a late night run to one of the casinos to try her luck either. More recently she had lived in Slinger and then West Bend. She is survived by her daughter Jayne Burton of West Bend, grandchildren Dan and Sara, her sister Julaine Demge of Oceanside, CA, other relatives and friends. She is preceded in death by her husband Buddy and grandson Michael. A Mass of Christian Burial will be celebrated at 6PM Thursday, August 30, 2012 at St. Peter of Alcantara Catholic Church, 1802 N. Wisconsin Street, Port Washington. Reverend Patrick Wendt will be the celebrant. Interment will take place at St. Mary’s Cemetery in Port Washington. Visitation will be from 4-6PM Thursday AT CHURCH with a 4PM Rosary. Memorials to the charity of your choice appreciated.